In the mystical realm of Ryntia, the forces of the underworld are aligning to unleash a plague of evil upon the surface. The deadly bat-like Blood Reavers, the Saurian Maurauders, the Orcish Warmongers and the feline Shadow-cat mercenaries have pledged their respective clans to the service of Bre'Gwen, queen of the deep elves. 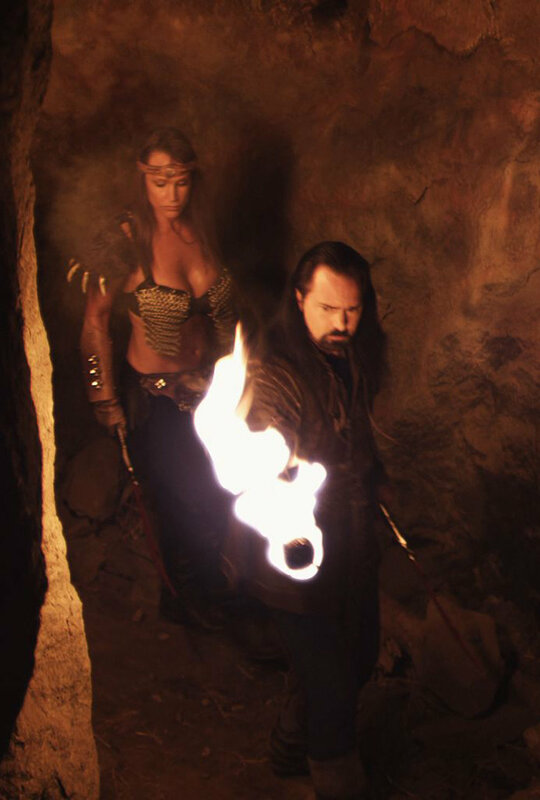 Together they seek to destroy the human and Elven kingdoms and rule all of Ryntia in the name of evil. But even with their combined strength, Bre'Gwen's forces are no match for the powerful Grayraven kingdom led by the majestic king, Garrick Grayraven. To ensure their success, Bre'gwen forges an alliance with an unlikely human who holds the secret to acquiring a powerful artifact that will allow them to summon and control an army of undead warriors from centuries past. Guided by fragmented visions, a mysterious Oracle gathers seven unlikely heroes to face the threat. 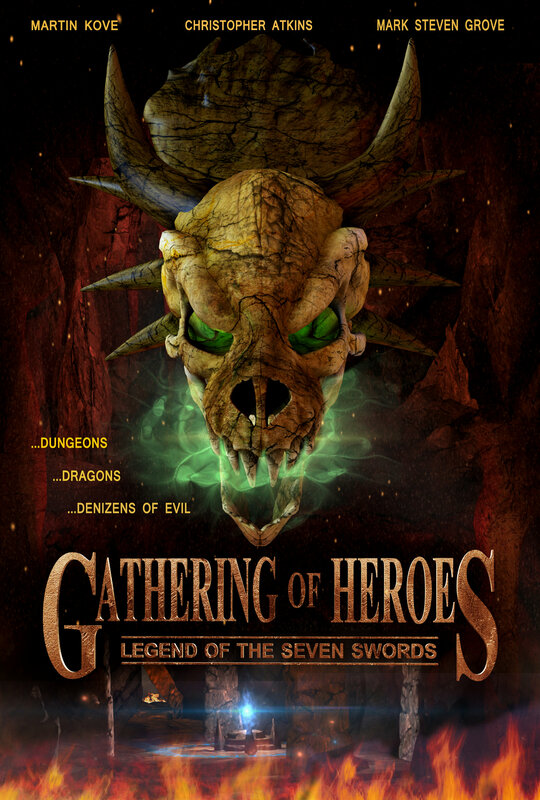 A heroic knight, a deep elf sorceress, an eccentric bard, a silver elf druid, a righteous paladin, a barbarian huntress, and a brooding thief are the only ones capable of stopping this evil at its source...but first they must embark upon a quest to find the legendary seven swords of Draconus. When rating this film we cannot fairly compare it to anything but similarly-made movies. This has all the trappings and feeling of a full fan-film... but somewhat better invested and carried out. Viewers quickly realize this is full head-on schlock, but it's FUN head-on schlock. Unlike typical "barbarian" films or some of the really bad fantasy films we have seen come across the SyFy channel, this one has interesting characters, a variety of races, some decently-made weaponry, a script that isn't terrible, acting that is quite terrible, and is pretty much watchable all the way through. Role playing gamers will love this. It has everything from dragons to thieves to dark elves. Yes, the script is often corny, some of the acting stupendously wooden as a fence post, and some of the lines right out of the cliche handbook-- but who cares? This isn't cerebral, it probably had a budget of four figures, and no one should be taking this seriously at all. What it does have-- and is why I give it 6 stars instead of something way lower-- is heart that is usually lacking in such films. Evidently the writer-director knows his gamer lore and puts his love of the genre into the whole film. That's is exactly what it feels like all the way through-- a role playing game brought to life. From the beginning "gathering of heroes" to the very final scene this feels like a game-master-operated scenario, with the players doing the best they can in their respective roles and trying not to die long enough to collect their experience points. The ending is horribly cliche and actually gave me a chuckle-- which is far better than a thumbs-down. All in all, if you're looking for good schlock instead of bad schlock-- this is pretty decent. Terrible filming, terrible CGI, a main wizard that makes you cringe every time he utters a line-- and some pretty enjoyable characters and "game play" all the way through. Those who rated it 3 or4 stars are absolutely correct; it's that bad. But depending on your mood and how you look at the film, it's better than a lot of other fantasy films out there. That's why I rate it a littler higher, because it managed to rise above the rest of its class. It's not that it's good... but for what it is, it's not awful. ;D Another Z-grade indie fantasy flick that's heavily indebted to LORD OF THE RINGS. This one is chock-full of garish colours, bright costumes, and cheap and cheesy CGI effects. It's a standard battle between the good-looking heroes and the ugly villains, dragged down by laughably wooden acting and a derivative feel. Some fun martial arts fights enliven a scene or two.